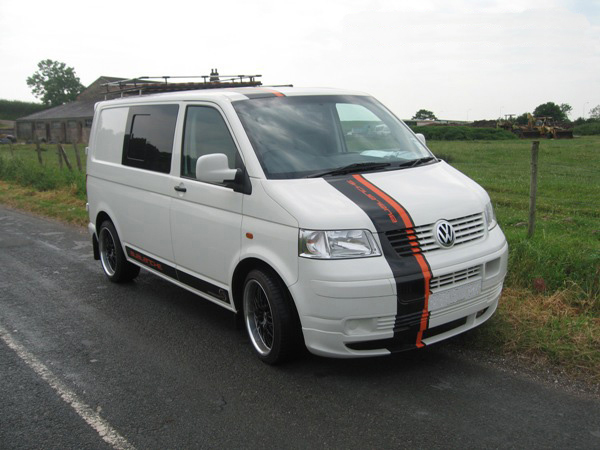 Avalanche Surf Bus (VW Transporter T5) ~ Vandezine By Van Bodies (Lancs) Ltd. The inspiration behind the Avalanche was to create a versatile vehicle based around a modern reliable light commercial. The ever popular T5 VW Transporter was chosen for its reliability, rock solid residual values and cult status rolling forward from the "Surf buses of the Sixties". When the vehicle arrived it had enjoyed an easy life on contract hire and had been fully serviced and in the proud ownership of only one owner. The factory white paintwork was unmarked and only in need of a well deserved polish, but only after the "Avalanche transformation" had taken place. Van Bodies have also equipped the bus with a very special roof rack of their own design again based around design queues taken from the "Surf Buses" of the sixties using modern manufacturing techniques we have created a roof rack, using genuine Ash lathes stainless steel mounting legs and lashing rails gives an authentic feel to the whole vehicle. This rack will be marketed in its own right very soon as Van Bodies are receiving great interest from VW T5 owners looking for something unique, authentic and of high quality. Avalanche boasts 19" black and chrome sports wheels with low profile tyres and 40mm lowered suspension give it a low aggressive stance. The front and rear bumpers are colour coded to match the exterior body colour, an original VW rear tailgate spoiler and matching front lower air dam were added to complete the desired look. The protective plywood commercial lining was removed to reveal perfect as new side panelling and before re cladding the interior the wiring for the in-car DVD media and LED lighting systems were carefully fitted into place accommodating a split charge system for the onboard power driving an LCD 15" TV monitor with iPod connection and PS 2 games console. The interior cavities were then fully insulated with eco friendly insulation before being lined in high quality velour carpet to all the interior surfaces giving a warm comfortable interior space. The coach builders were given a free rein to design and manufacture a stow away table for the interior based around the surf bus idea, as you can see the surf board shaped table design they came up with is as versatile as it is unique stowing away completely into the off side interior panel. Avalanche was then equipped with two M1 tested Cogent free standing tip up seats trimmed in genuine VW Inca fabric to match the cab interior. The seats are completely versatile as they can be rear or forward facing anywhere along the length of the tracking, equipped with all age seat belts even younger passengers can adjust the seat belts to their own shoulder heights. Seat locking is provided by the new generation "Unwin Traxion Lockables" state of the art floor locks giving safe and secure seat location. The front offside panel and opposite sliding door panel are fitted with limousine tinted bonded windows fitted with sliding openers. The internal wheel arches and side and rear door apertures are coated with rubberised spray on liner... a highly resilient waterproof protective polyurethane film that protects the steel surfaces from impact damage and adds to the specialist feel to the interior. To allow access for disabled customers the floor is equipped with Unwin aluminium recessed floor tracking to allow the securing of a wheelchair or attachments for mountain bikes and extreme sports equipment, the upper surface is fitted with deep pile black carpet.